3 February 2016 – Leading up to World Cancer Day (4 February 2016), the Fix the Patent Laws coalition released a short video highlighting how shortcomings in South Africa’s patent laws contribute to barriers to access for critical breast cancer medicine trastuzumab. 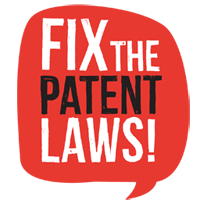 The Fix the Patent Laws coalition is a coalition of 18 patient groups, including the Cancer Alliance, and Alliance members: the Cancer Association of Southern Africa and People Living with Cancer. This briefing document provides background on trastuzumab and patent-related barriers to access. Trastuzumab is recommended as an essential medicine by the World Health Organisation for HER2 positive breast cancer, yet its high cost means the majority of women in South Africa who need it will never access it. In South Africa, only pharmaceutical company Roche’s branded versions of trastuzumab are available, sold under the brand names Herceptin and Herclon. In the private sector, a 12-month course of Herceptin costs approximately R485,800, or more if higher dosing is required. Unless significantly lower prices are made available to the Department of Health, trastuzumab is unlikely to be purchased on tender and made available for use in the public sector. At present, public sector access to trastuzumab is extremely limited and requires a case review by a health facility’s Pharmaceutical & Therapeutics Committee, which may — and often will — reject a patient’s motivation for the drug, based on cost. The majority of woman seeking care in the public sector that could benefit from this medicine are never even informed about it. HER2 positive breast cancer patient Thobeka Daki, from the Eastern Cape, learned that she needed trastuzumab after being diagnosed with HER2-positive breast cancer at a private facility. Says Thobeka, “I’m now using a public hospital and the doctor never ever mentioned Herceptin to me.” She added, “I think if I get this treatment it will give me a chance to see my two sons and my grandson growing”. During 2013 Roche earned over R100 million from the sale of Herceptin in South Africa’s private sector, and approximately US$6.6 billion in global sales in 2014. What do cancer activists have to say? “When [my doctor] told me that my treatment is half a million the first thing that came to mind [is], as a cancer survivor and a supporter, I am with young women and I could see them not being able to access this… There are women who are 40, 30 and they’ve got small children and then they have to lose their lives because they cannot afford Herceptin. 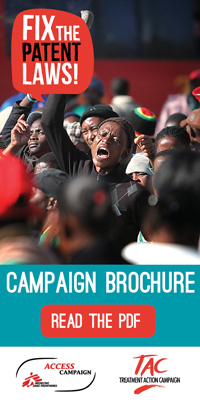 It should not be like that.” – Lillian Dube, actress and cancer patient activist. “If you do not have the money to buy the drug then you don’t have access to it… Irrespective of where you are in the country you have the right to access to treatment and access to the drugs needed. Hopefully we can make that change. It will make a huge difference to all women in South Africa.” – Louise Turner, breast cancer survivor and advocate. How do problematic patent laws contribute to high medicine prices? Roche holds multiple patents on trastuzumab in South Africa, which could guarantee it a monopoly on the medicine’s sales until 2033. Roche’s patents will expire at least 10 years earlier in other countries, such as the UK, US, India, and South Korea. South Africa’s Patents Office currently does not examine patent applications, and has therefore granted a number of patents on trastuzumab that have been rejected in other countries. As competitors’ biosimilar products enter the market in countries where trastuzumab patents have expired or are no longer in force, prices should fall as a result of increased competition. South Africa could miss out on such price reductions for trastuzumab so long as patents block the use of more affordable biosimilars. For nearly seven years, South Africa’s Department of Trade and Industry has taken piecemeal steps toward reforming the country’s patent laws. More rapid action is required to establish a proper patent examination system that prevents the granting of low-quality patents to pharmaceutical companies, and puts in place legal safeguards that limit the abuse of market dominance by patent-holding companies. Fixing South Africa’s patent laws will enable women living with HER2-positive breast cancer and other diseases to have access to the medicines they need at affordable prices. Perez E, Romond E, Vera Suman, Jeong JH et al. Trastuzumab Plus Adjuvant Chemotherapy for Human Epidermal Growth Factor Receptor 2–Positive Breast Cancer: Planned Joint Analysis of Overall Survival From NSABP B-31 and NCCTG N9831.